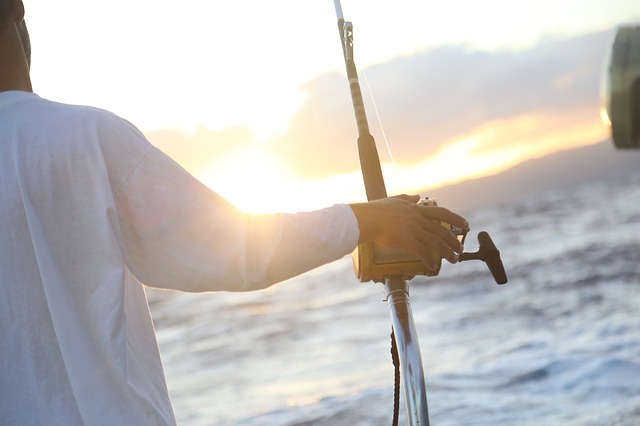 Saltwater fishing can be done from a pier or a boat, in the surf, in a bay or many miles from shore. Saltwater fish are going to be attracted to different bait than freshwater fish, however, all fish are going to use their sense of smell to hunt their prey. Saltwater and freshwater fish can both smell better than dogs, but they are not attracted to the same scents. Keep this in mind when you target saltwater fish. Anglers subscribe to the fishing mantra "Match the Hatch", meaning that you need to match the bait to your target species prey. For example, sailfish love to eat flying fish and ballyhoo that swim in schools. Trolling with those, live or dead, will result in more billfish hookups than sitting in one place with a chunk of squid on your hook. Even if you don’t have one fish in mind, saltwater fishing with bait fish, cut bait, shrimp, or shellfish can hook a fish. Pair saltwater live bait with these four quick tips for choosing the right bait. Shrimp is a go to bait for saltwater anglers. This all-purpose bait works because shrimp are common in saltwater environments and fish are attracted to the scent and movement. Dead or alive shrimp can be used to catch fish onshore or offshore. Since shrimp can attract fish of all sizes, big fish are as likely to grab a bite of smaller ones. These fast free meals can cause shrimp to can get expensive as a bait, but it does usually yield results. Snapper, redfish, and any number of fish love shrimp. Lots of different species of fish eat shellfish like clams, mussels, or crabs. Anglers like the versatility of shellfish as bait when trying to catch a fish. Clams can be slippery so some anglers let shellfish harden in the sun on the hook for optimum results. Fish, like grouper, are attracted to the scent of shellfish. Crabs require special handling to keep from having a claw clamp down while putting on a hook, but this is worth it when trying to catch copia. Anglers often catch shellfish to use as bait, but make sure to check with local listings beforehand. Some mussels or clams have regulations. Cut bait has a strong aroma which is a key way to attract saltwater fish. Cut bait can be made by cutting up bait fish or smaller fish you have caught throughout the day. You can hook a plethora of fish with cut bait, like sea bass, mahi mahi, and bluefish. Cut bait is effective for all saltwater fishing, whether you are offshore, on shore, or surf fishing. Eels, ballhoo, and pilchards are commonly used to catch saltwater game fish. Anglers often choose this bait, since fish are naturally drawn to the movement and scent of their prey. Bait fish can be caught with a cast net and kept alive in a livewell or with frozen packs available at your local bait shop. Keep in mind some fish will only eat live bait. Grouper and amberjack find a five pinfish hard to resist. Identifying the target species will help you narrow down the right bait to use. Professionals often switch up their tactics, so don’t be afraid to try a new bait! Fishmaster Pro Tip: Never handle bait if you have sunscreen or insect repellent on your hands. Fish can smell the chemicals and they will avoid your bait like the plague.